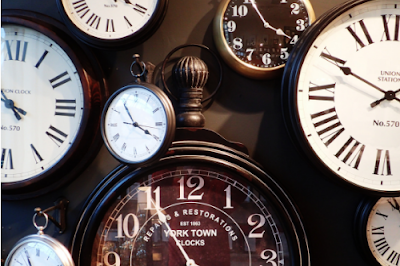 Seamless Piecing: Got the New Year in the Bag? Got the New Year in the Bag? Happy New Year everyone. Where does the time go?!? I'm glad your holiday was safe and I wish you a happy, healthy and Sew-ful 2019. A bunch of years ago I was in need of a new purse. The previous one had been around the block so many times the handles fell off. I was very sad because it fit all my criteria for an awesome bag. A handle short enough to carry at the elbow without banging around my knees, yet long enough to pull up to the shoulder if needed. An easy to access cell phone pocket. I really didn't think my requests were that extreme. But stores everywhere seemed to disagree. The style seemed to be big and bulky with a dozen zippered compartments and pockets. I just wanted a purse, not a memory game! After a frustrating search, I realized the only place I'd get a bag to suit me would be from my sewing room. That was an exhilarating thought since I had only been sewing/quilting for a few months at that point. After searching online for weeks, I finally found a pattern I really liked. Here's the link to the free ReversiblePurse pattern. I made some modifications that I'll share today. Keep in mind, it will not be reversible after the pockets are on. For that first project I picked fabric from my pile that I knew I'd never use for anything else. I thought it was a good idea to test drive the pattern before using fabric I loved. In less than an afternoon I had a new bag. 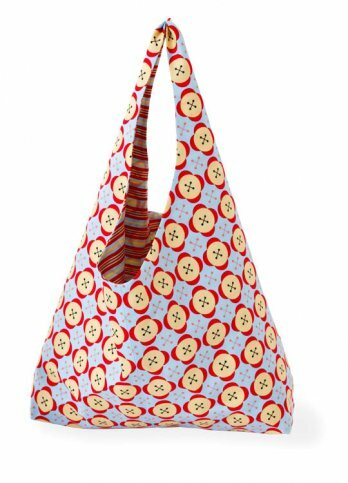 And as an added surprise, I loved the fabric once it became a bag. Time to retire this old friend. Even though that was 6-ish years ago, I'm still dragging around the same old bag. I'd have given the bag an honorable discharge a couple of years ago except I couldn't find the pattern. Not in my “carefully organized” piles of papers, or online. 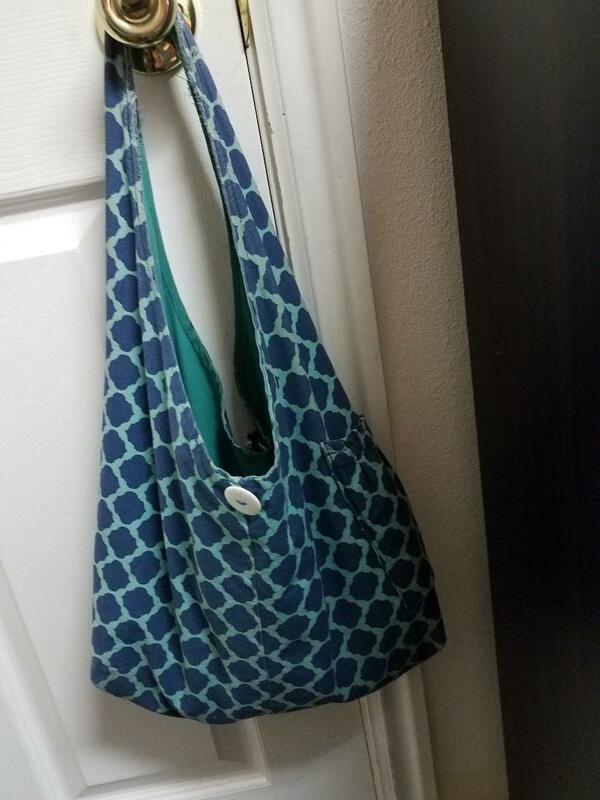 With the dawning of this New Year, I decided it was time to make a new bag even if it meant picking apart the old one and using it for a pattern. I could tell it really was time when I said to the Hub “I'm making a new bag.” He nodded and said “Good”. Usually when I tell him what I'm making he just grunts. In a last ditch effort to find the elusive pattern, I did a Pinterest search and... There it was! Why didn't I think to search Pinterest long ago? Again I downloaded the free pattern from AllPeopleQuilt.com and selected fabric from my stash. This time I'm starting out with an Amy Butler print that I love! Grab your download, pick your fabric and let's do this! This tutorial presupposes you have the pattern and instructions in your hands. A printed copy of the pattern. Fusible Fleece 4”x16” and a second piece cut to fit. More about that later. 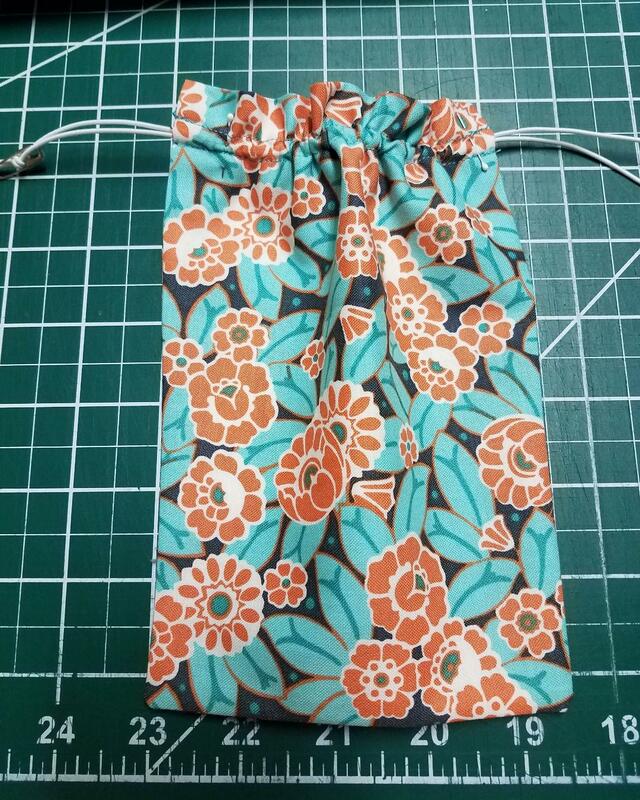 Using the pattern piece labeled “1 of 3”, cut out the handle padding. 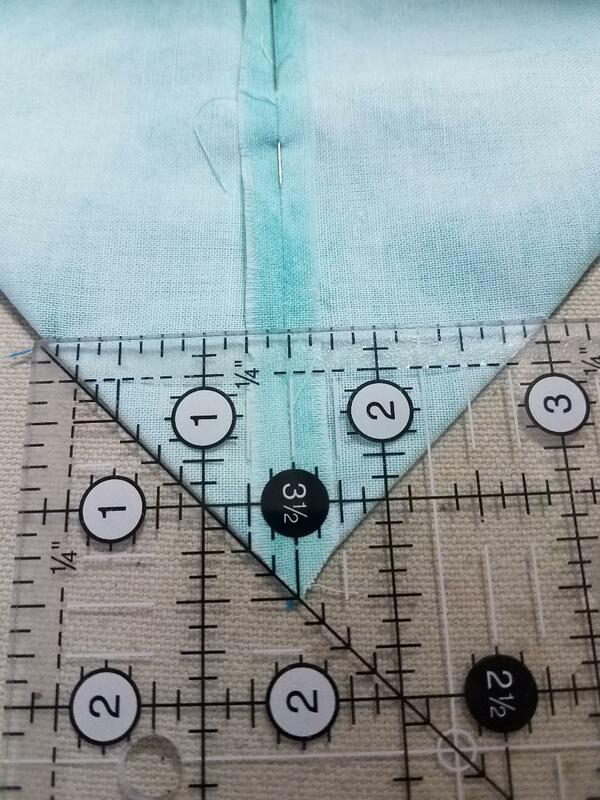 TIP: the pattern lays at the fold on TWO sides. Fusible Fleece doesn't fold well so just place and trace the pattern 4 times. It won't be seen so it doesn't have to be beautiful. 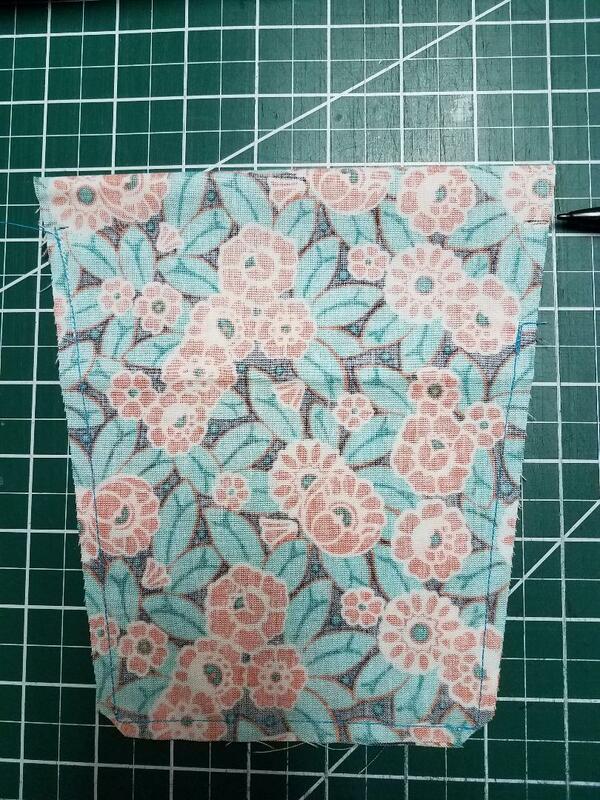 When you cut the fusible padding, leave off the seam allowance to prevent bulk. 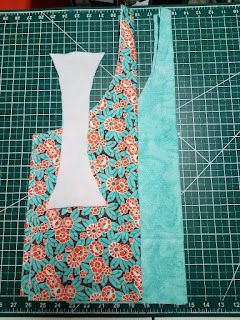 Following the pattern instructions, fold and cut the fabric for body and lining. Set all that aside for now. This one is easy. This pocket is small, just the right size for a lipstick and a cough drop. It will not tolerate weight without distorting the drape of the bag. 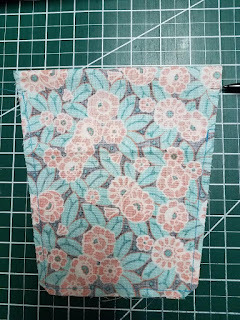 Cut a rectangle from either fabric that measures 7” x 5”. Sew around the three raw edges leaving a 2” hole for turning on the side opposite the fold. 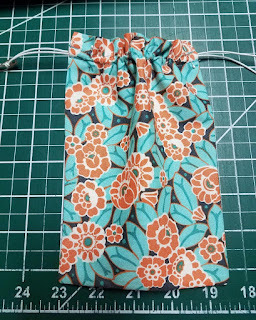 Turn the pocket right side out, push the corners out nice and square, and press, tucking in the seam allowance left by the hole. Lay the lining piece so one layer of fabric is face up in front of you. Place the small pocket so it's centered on the panel and about 4 inches from the bottom. Pin it in place and sew the three sides, backstitching at the top corners for durability. Build an outside pocket to hold a cell phone: Not as easy. Sorry. But worth it. This pocket will be roomy enough to hold your phone and glasses. An elastic at the top will keep your phone safe. To make this happen we'll need to use a little faith, a lot of trust and a sprinkle of magic. Measure your phone and add 1 ½” to the width, and 1” to the height. This is the finished size you want your pocket. For example: My phone is 3”x6”. I want my pocket to finish at 4 ½”x7”. On the raw edge opposite the fold, mark a spot 1” from the side on both sides. Use a straight ruler and rotary cutter to cut an angle from the marked point to the very edge of the fold on both sides. On each side you just cut, place a mark 1” down from the fold. Sew around the three raw sides. On one side begin sewing slightly below the 3/4” mark. At the other side leave a hole about 2” wide for turning. Backstitch at the beginning and end. Clip only the two bottom corners. Turn the pocket right side out and press. Include starch when pressing the seam allowances of the holes so they are nice and smooth. 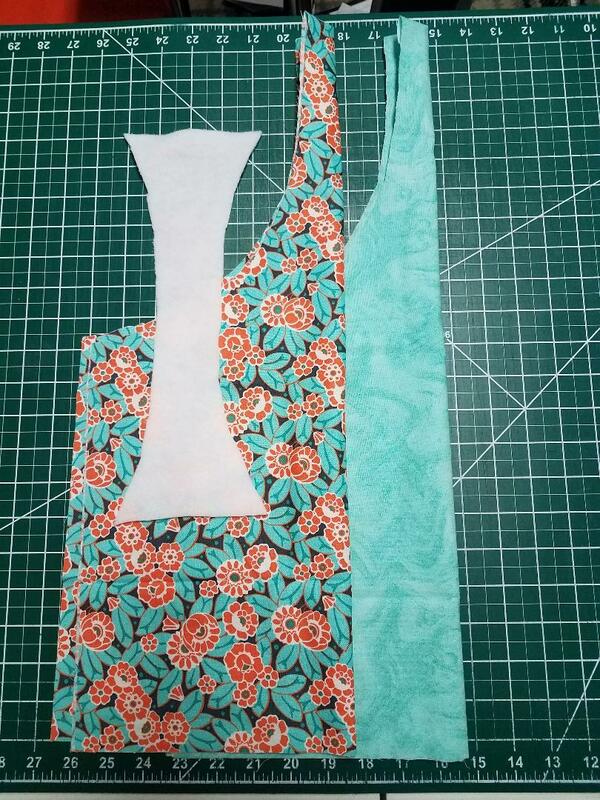 Draw a line across the top of the pocket 3/4” down from the fold. Sew along that line from edge to edge. Be sure to tuck in those pressed seam allowances. Mark that measurement on the elastic. Center the markings so there is length on both ends. 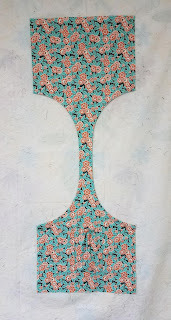 Thread the elastic through the pocket so it sits snugly above that sewn line. It should hang out both sides of the pocket. Using a zipper foot or pins to keep the elastic pressed against the line, sew a second line just above the elastic. Do not catch the elastic in the sewing. Gather the fabric onto the elastic until the edges align with the marks on the elastic. Pin this securely so neither the pocket or the elastic slips out of place. Pin in place but do not fuse it yet. 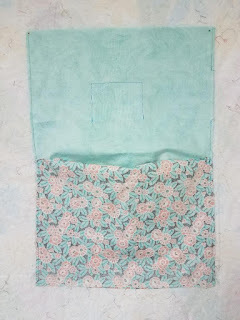 Lay the main bag fabric panel so it's right side up on a pressing surface, with the fusible fleece pinned to the back. Through the fabric, identify the edges of the fleece on the back side. Place the pocket so it lays above the fleece. Adjust the fleece or pocket as needed. When you are happy with the placement, move the pocket and press to fuse the fleece to the bag according to manufacturer instructions. It may be helpful to draw, with an erasable fabic marker, where you want the bottom and sides of the pocket to be. Put the pocket back in place and glue, baste or pin well. Follow the marked lines to align the sides and bottom. Some manipulation will be needed to match the sides to the lines. 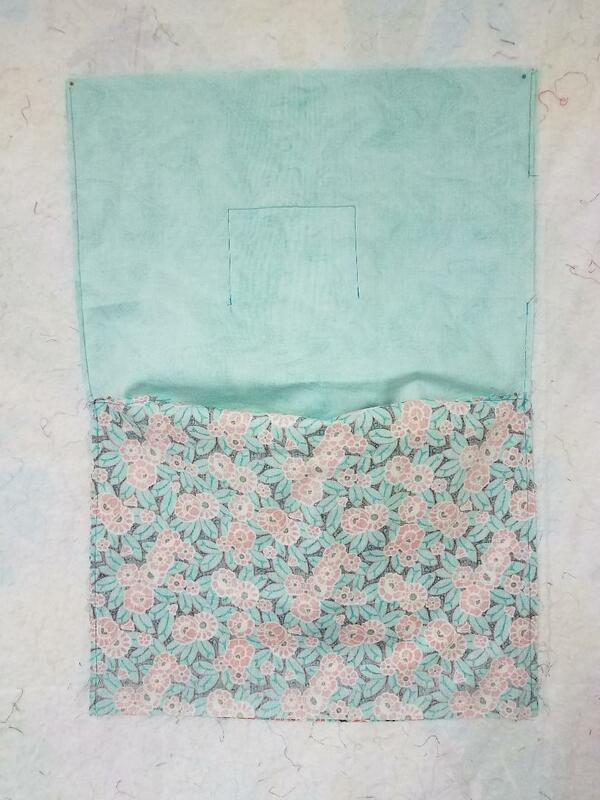 At the top it will be easier to bunch the bag to fit the pocket, rather than stretching the elastic to meet the lines. 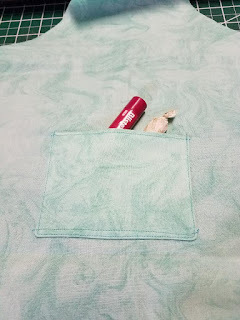 Sew the pocket to the bag with a neat top stitch. I recommend using a guide foot. Backstitch over the elastic, and at the top corners of the pocket on both sides. There will be a lot of stress here so give a good tacking for durability. Clip the elastic ends as close as you can. HOORAY! All the hard part is done! When the pockets are on, go back to the printed pattern. Place the fabric pieces right sides together. I like my pockets on opposite side of the bag. If they are on the same side it's fine. Sew, snip and turn the handle as per the pattern. Lay the fleece onto the handle to check for fit. Trim whatever is obvious. Stuff the padding through the handle and fiddle with it until it lays flat. If it won't lay flat, pull it out and trim again. When it's laying flat inside the handle, press on top and bottom to activate the fusible. Return to the original pattern instructions. Pick up at Assemble Bag #3. Note on Diagram 4: Only sew the sides, NOT the top or bottom. Also leave an opening in the side of the lining for turning later. Here's a video on how to box corners for us visual learners. I thought it needed a final topstitch around the handle. Totally optional. Start somewhere inconspicuous (not at the seams) and topstitch all around one side of the handle, then all around the other side. 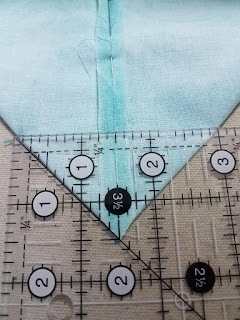 Use a guide foot to keep the topstitching straight and beautiful. If you want to add a closure I recommend a magnetic clasp. I put a super clever elastic button closure on mine... and the cat promptly ate it. I haven't missed it, so I'm not adding one this time. 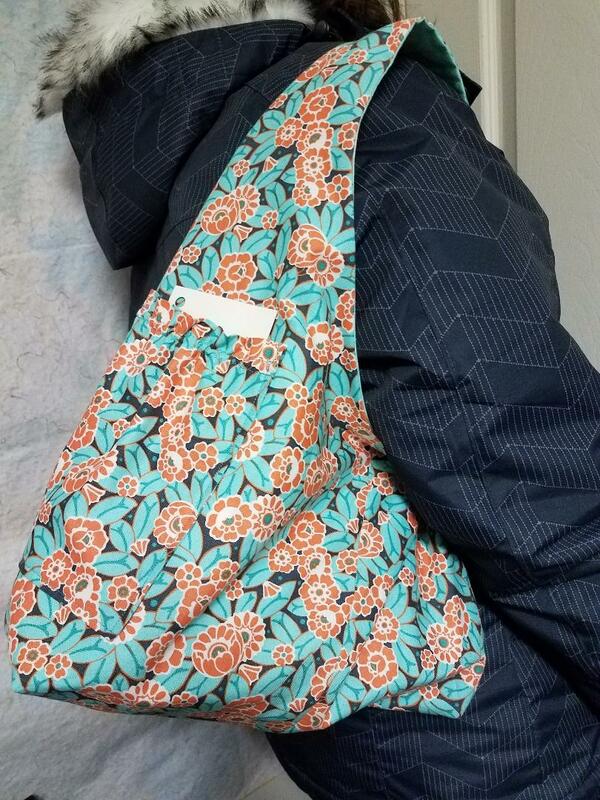 I'm ready to step into the new year with confidence and a great new bag... if I can get it back from the model. I love how many times people comment on my pretty purse. Share with us how you Bag the New Year. Add a photo on our FaceBook. If you have any questions about the pattern, leave them in the comments below. Not a follower? There's a button in the right column. See you next week with a nifty DIY!